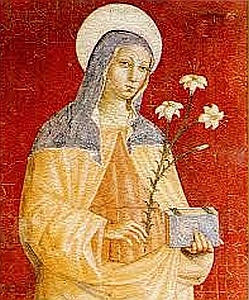 Born Chiara Offreduccio (1193-1253), St. Clare was from an influential noble family, part of a class that dominated the social and economic life in the region of Assisi in the late medieval era. As such, they were natural opponents of the emerging middle class to which the family of St. Francis belonged. As a result of the uprising of the commoners in 1198, Clare’s family was exiled from the town until 1205. In the years after her family’s return to Assisi, the young Clare increasingly devoted herself to a life of prayer, penance, and charitable works, deciding to remain a virgin rather than enter a socially advantageous marriage. Hearing of her virtue, Francis talked with her, and on Palm Sunday in 1212, Clare left her family home to join Francis in his way of life. Francis settled Clare and several other noble women who joined her at the Church of San Damiano outside Assisi, drawing up a brief form of life for these “Poor Sisters.” Around 1228, Pope Gregory IX replaced this with regulations he had composed. However, Clare continued to press for her own vision of Franciscan life and, shortly before her death in 1253, Pope Innocent IV approved the Rule she had composed, preserving the radical commitment to poverty, to which she clung throughout her life as a religious. Hers was the first such Rule, written by a woman, to be approved by the Church. Following Clare’s canonization (her feast day is August 11), her sisters became known as the Order of St. Clare, or “Poor Clares.” Like the Friars Minor, the Poor Clares have experienced a number of reform movements, the most notable being the one begun by St. Colette of Corbie in the 15th century. The Poor Clares blend traditional structures of monastic life with the Franciscan charism, emphasizing Clare’s cherished values of simple living and sisterhood. Each monastery is autonomous, although in recent decades most have joined in various federations for purposes of formation. The sisters are primarily contemplative, devoting themselves to prayer and supporting themselves by the work of their hands. There are several Poor Clare monasteries in the Province of St. Barbara and the friars are committed to assisting in their spiritual care. Adapted from information provided in the Holy Name Province website.